It was more than 15 years ago that a website for the 301st Bombardment Group of World War II was created. 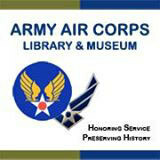 Within a few years, the Army Air Corps Library and Museum was born as a Texas based 501(c)(3) non-profit organization. Beginning with exhibits at partner museums and special veterans' gatherings throughout North Texas, the Army Air Corps Library and Museum attracted donations of many artifacts. The collection grew to the point that a displays were presented on a rotating basis in our public events. Our programs and exhibits expanded to include schools and numerous reunions of veteran groups. These programs ranged in duration from a few days and to some that lasted more than six months. Over time our preservation efforts became more sophisticated, working with artifacts that included fragile items like photos and documents, and all the while building an impressive and expansive collection that has become the envy of many museums. The Army Air Corps Museum has achieved this without the benefit of a location that is accessible to the public on a daily basis; instead storing the artifacts at a number of secure facilities until they are needed for a specific exhibit. The time has come. Our collection has grown to a size where our programs and displays are bursting at the seams. We need a permanent physical home to do justice to our collection, and to honor our donors, and the men and women who have served this great nation of ours. We need your help. We have begun to raise funds for a campus that can accommodate a proper exhibition and education center. Within that facility, we will offer what we call “STEM-HD” focused experiences for proud Americans and students of all ages as we 'Save military history, one soldier at a time'. Telling each soldier, sailor, airman or marine’s story is the confluence of science, technology, engineering, math, geography and history. We offer a unique learning experience, from foundational conventions to critical thinking and emerging applications. We link the past, present and future. And we connect the lives of American citizens with the military experiences of those who put their lives on the line to preserve the liberty we enjoy today. Following on our first website we have launched and maintain over 40 websites. Just like our collection and museum these evolve and grow all the time. We have amassed more than 120,000 web pages of priceless historical information and the collection continues to grow daily encompassing information from World War I to present day encompassing the Army Air Service, Air Corps, Air Forces and the current US Air Force. A significant component regards the data we have published with a strategic partner concerning the remaining airmen missing in action from World War II. Join with the Army Air Corps. Donate today. Our mission is simple, yet critical. If you are reading this then you are one of a dwindling number of Americans with the courage to help preserve our nation’s military heritage. Ignorance, and a disregard for history is our enemy. We need your help to overcome it, lest the stories of the brave Americans who fought for our freedom are lost forever. We seek to partner with like-minded individuals, businesses of all sizes, educational organizations, veterans groups, museums and media outlets to help us build this new campus in the North Texas area. We invite you to contact us to discuss how we can work together. Your donations can come in many forms. Clearly, your financial support is a priority. There is no minimum or maximum amount that you can give. All amounts are appreciated and tax-deductible. 100% of your donation goes to support the Army Air Corps Library and Museum and our educational mission. Artifacts represent another important way for you to donate. From World War I to Present Day and all conflicts and engagements in between; small individual items to many artifacts, they are all important and valued donations. Please contact us to discuss the type of materials you would like to share with our museum and get specific and secure shipping information. We will make sure the items are properly cared for and preserved as custodians of your family heritage.